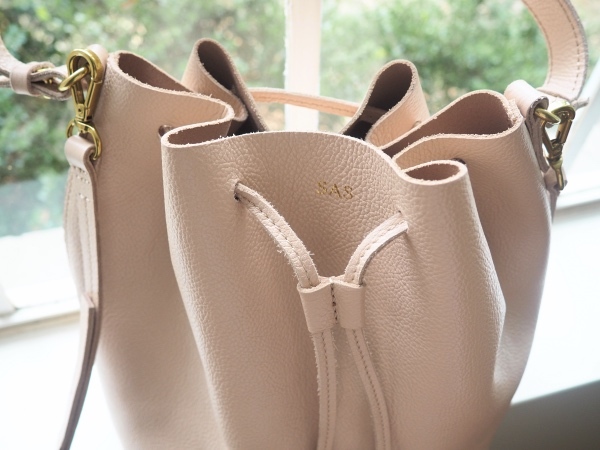 Honestly, I've always loved the style of bucket bags but wasn't sure how functional they were. 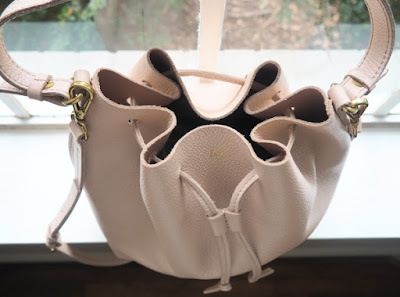 I usually go for bags with a little more structure, but I actually love this bag. It's pebbled leather, so it hasn't scratched a bit in the couple weeks I've used it, but it's also very soft and flexible. 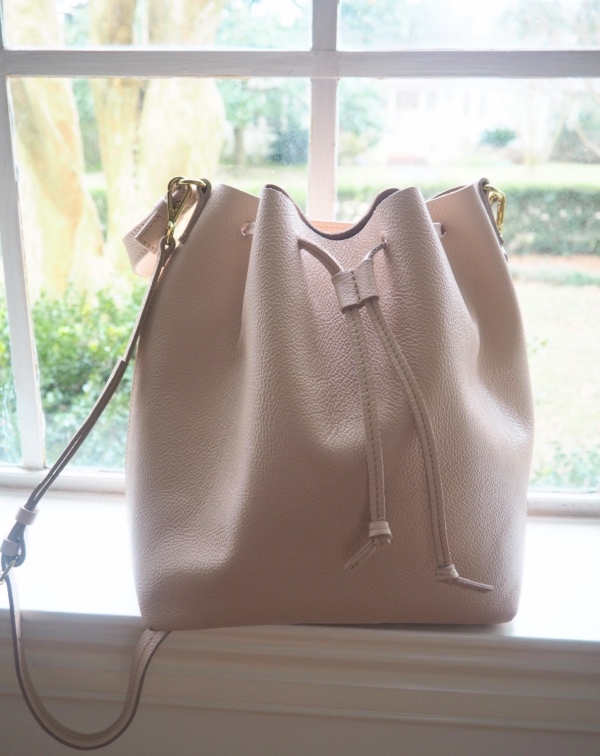 The blush color is a great neutral, but is going to be so cute in the spring too! I love that I can close it up with the drawstring but still reach my hand in if need be and it seriously fits everything I could ever want. I'm talking my blogging camera, a book, waterbottle, etc, plus the everyday stuff. Another big plus is the fact that it has a crossbody or over the shoulder strap (which can be adjusted for length!!) AND an elbow strap. When I'm carrying heavier things or walking around for a long time, I usually use the cross body strap. But the elbow strap is great for getting in and out of my car, running a quick errand, carrying many things at once, etc. The only con is the lack of organization inside, I'd say. Everything sort of falls together in the bottom and you can't really designate a specific space for anything because there is only one interior pocket for gum/business cards/chapstick/etc. 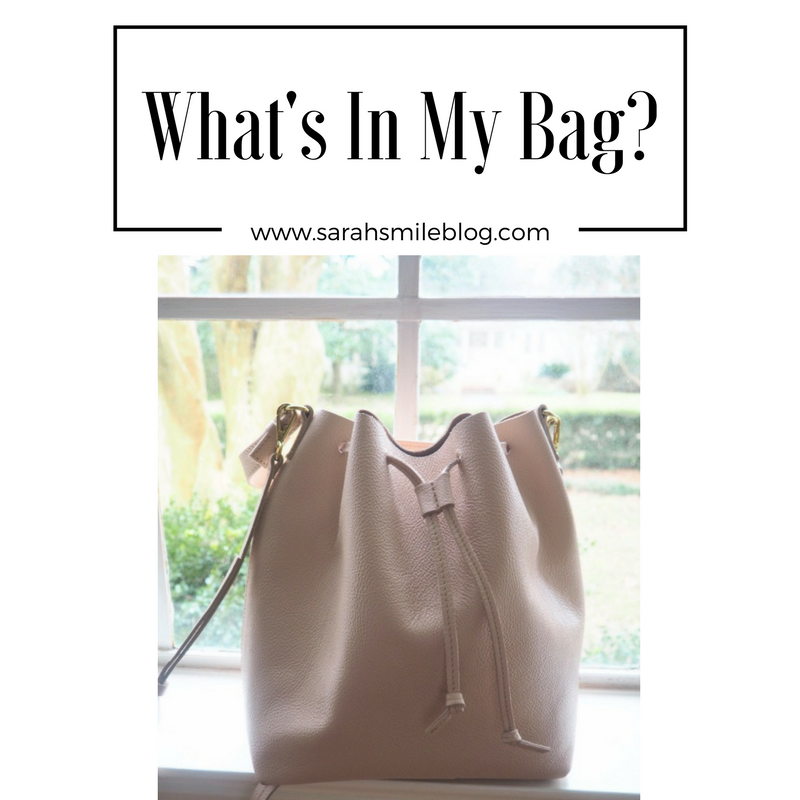 Other than that, I absolutely love it and think it's a great bag for everyday use and would recommend it 100% to anyone needed a new purse! It's comes in lots of colors and is 100% leather so it'll age really well. I don't kid around about having dry skin. I can't live a day without Chapstick, and I happen to be obsessed with buying them, so I have 3 in there. And hand cream, just in case. The Burt's Bees minty lip balm is my absolute fav! Y'all, how people live their lives without these is beyond me. The Compeed pads are a life saver because they're much thicker than band aids and they insulate blisters for 2 days! No more worrying if your band aid will come off while you're walking around. But I also keep band aids in case of cuts and scrapes because you really never know. I just made my blog business cards a few weeks ago and then I was sweetly gifted this monogrammed business card holder for graduation. I try to always keep them with me so that when my blog comes up in conversation I can give them something to hold onto and remember my blog by. So many times I meet someone at the mall or bookstore, we discuss my blog, and then I know they're never going to remember the name once they leave. So these are a big help, plus they're really cute. It never fails that the day I go without makeup and dry shampoo, I end up having to run errands or go meet someone for dinner, etc. I keep samples or the minis that you get in travel aisles in this adorable J. Crew clutch! That way I can at least touch up with some concealer or give myself a little mascara when I'm feeling a bit rough and I never have to feel self conscious after a long work day. Now that I don't have class anymore, I have so much more time for reading. I hate that feeling when you're bored in a waiting room or stuck with no one to talk to and you immediately zone out on your phone. I'm trying to make more time to read, rather than staring at a screen all day long. I just finished "The Couple Next Door" and I loved it. Starts a little slow but so suspenseful and so many surprises! 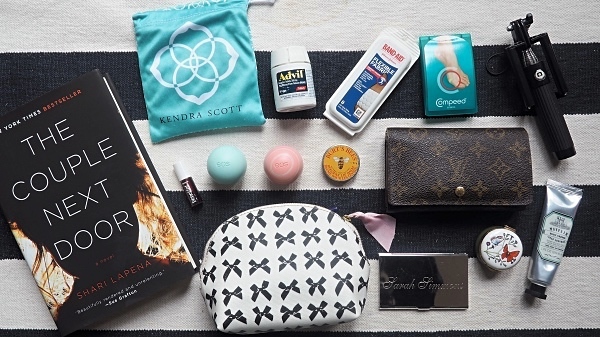 What are your "everyday necessities"? Also, do you have any book recommendations? I love history, cheesy romance, comedy, you name it! Comment them below so I can get to reading!